Credit card usage is at an all-time high, with Americans carrying nearly $4 trillion of credit card debt. Part of this is driven by necessity. For instance, people use credit cards to build a credit history and to pay for purchases at cash-less retailers. But people also use credit cards for the numerous benefits they provide. Credit cards are convenient, and many offer generous rewards and cash back. Plastiq is a payment app that lets you consolidate all your purchases onto credit cards, maximizing rewards and cash back. Consumers and small businesses can use Plastiq to pay with a credit card, even when a vendor won’t accept credit card payments. Learn how to use Plastiq, Plastiq fees, and whether it’s a good option for your business. Plastiq is a payment app that lets you pay for goods and services with a credit card, even when the vendor or seller doesn’t accept cards. For example, small business owners can use Plastiq to pay rent, taxes, or legal fees with a credit card, in lieu of a check, bank transfer, or wire transfer. For the convenience of letting you use a credit card, Plastiq charges a 2.5% processing fee. The San Francisco-based payments company was founded in 2012, but only recently did the company begin focusing more on their small business platform. Plastiq works with all major credit card issuers, and over 1 million consumers and business owners have used the product. You cannot use Plastiq to make payments on a commercial mortgage or other type of business loan. Plastiq charges a 2.5% fee for the convenience of letting you use a credit card (1% for debit cards). But the rewards or cash back that you earn from credit card spend often offset the fee. Plastiq might seem similar to Venmo or Square Cash, but it’s not really designed to pay friends, family members, or individuals, like a nanny or housekeeper. It’s also not accepted at cash-only retailers. In most cases (the exception is paying employees), the recipient is a business that accepts check payment, wire transfer, or electronic bank transfer (ACH). With Plastiq, your credit card becomes your primary payment method. 1. Create a Plastiq account. To begin using Plastiq, create a free account on their website. At this time, Plastiq does not have an iPhone or Android app. All you need to do is provide your name, business name, the reason you’re opening the account (for personal, business, or both), and a password. You’ll then be brought to the Plastiq home dashboard, where you can add your credit cards and specify who you’d like to pay. 2. Add your credit cards. The next step is to add your credit card, so Plastiq knows which credit card to charge. Click the button at the top left of the home dashboard which says “Add Your First Card.” A box will pop up prompting you to input your credit card number, expiration date, and billing address. 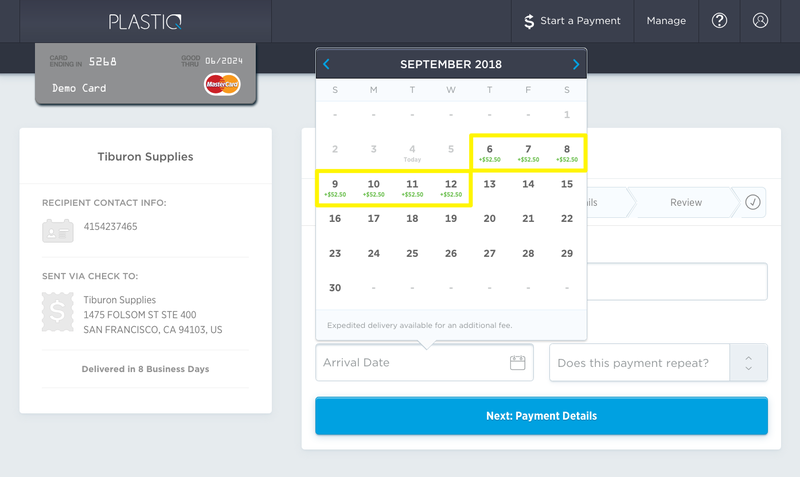 Plastiq syncs up with your credit card company, not just so they can charge you, but also because they need to know when you’ve run up against your credit limit. You can add as many credit cards as you want, or just add one. If you’re having trouble adding a card, you can contact Plastiq support for help. 3. Tell Plastiq who you want to pay. 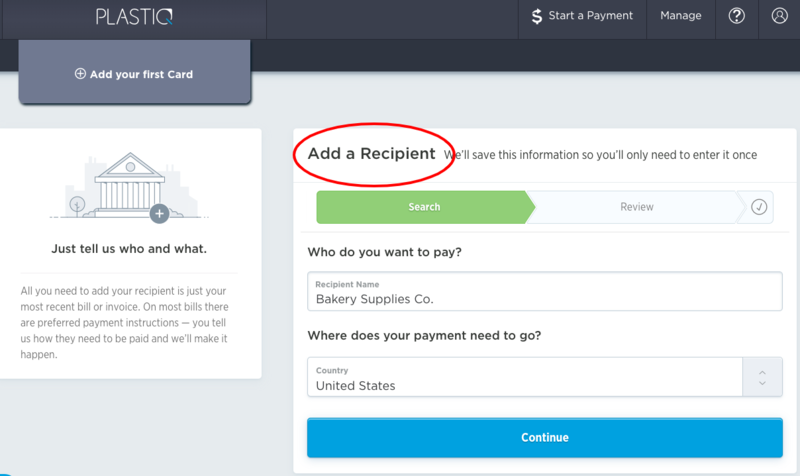 Next, you need to specify who you want to pay by clicking “Add a Recipient” in the center of the home dashboard. The recipient could be your landlord, a supplier, or your employees, for example. Remember, Plastiq will send payment to your recipients in the mode of their choice (physical check, wire transfer, or ACH bank transfer). You’ll need to provide enough information for Plastiq to facilitate the payment. Let’s say you have a bakery and want to pay your supplier with a credit card for a shipment of new baking pans. The supplier only accepts ACH bank transfers. You’ll need to provide the supplier’s bank account number, bank routing number, and contact information. This can usually be found on the invoice your supplier sent, or you can call the supplier for details. Prior to the very first payment, Plastiq will reach out to the supplier to verify their contact information. Once you add a recipient, Plastiq saves their information. You can easily schedule payments to them in the future without having to input their information all over again. 4. Plastiq pays the recipient. Finally, Plastiq will charge your credit card for the transaction, plus a 2.5% feethat goes to Plastiq. After charging your credit card, Plastiq will send payment to your recipient in their preferred mode (check, wire transfer, or ACH bank transfer). If they’ve asked for check payment, Plastiq will cut a check and mail it to the recipient. The recipient does not need to sign up for a Plastiq account. Plastiq keeps your and your recipient’s information secure. And there’s no additional processing time for using Plastiq. For example, an ACH bank transfer typically takes three business days, and using Plastiq won’t lengthen that time frame. In fact, Plastiq guarantees that their payments will arrive on time, or they will cover any late fees. You’ll be able to see a history of your scheduled payments from the dashboard. Plastiq charges a flat 2.5% fee per transaction to cover the convenience of letting you use a credit card. The fee is the same no matter who you are paying and regardless of whether you’re using Plastiq for business or personal reasons. To state this in clearer terms, let’s say you use Plastiq to pay $1,000 worth of business insurance premiums. In that example, you’ll pay $25 in fees. The fee for debit cards is 1%. Cards issued outside the U.S. can incur cross border fees. Expedited payments incur an additional 0.5% fee, plus handling, bank, and delivery fees. When scheduling a payment to a recipient, you’ll be able to view expedited delivery options and associated fees. Sometimes, Plastiq offers promotions or waives fees up to a certain dollar amount, so be on the lookout for any announcements. Should You Use Plastiq for Your Small Business? Plastiq can be a good option for small business owners who want to simplify their bills and maximize credit card rewards. But if you’re already in credit card debt or struggling to pay back your credit card bills, you might want to think twice before signing up. Here’s a closer look at the pros and cons of Plastiq. The biggest benefit of using Plastiq is that you can earn more credit card rewards. By diverting check payments and wire/bank transfers to a credit card, you increase your credit card spend and maximize rewards. Those rewards can be used to cover new purchases for your business or can be reinvested back in the business. More credit card rewards aren’t the only benefit. If you’re able to use a credit card to pay your vendors sooner, you can take advantage of early payment discounts. Plastiq fees are also tax deductible as a business expense. Plus, deferring expenses by one billing cycle can save you the trouble and expense of getting a short-term business loan. For many small businesses, the net benefits earned from using Plastiq more than make up for the fee. 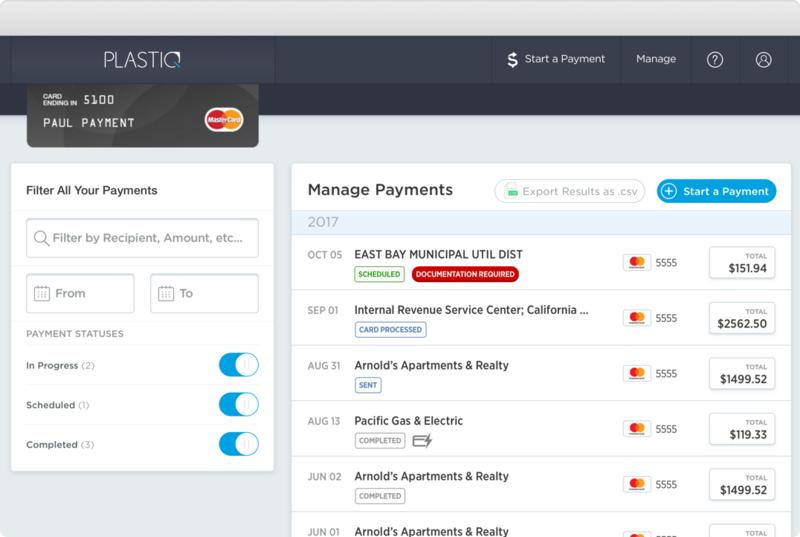 By consolidating credit card payments with Plastiq, you can gain more control over your business’s cash flow. For instance, say your payroll deadline is coming up in a few days, but you don’t have much cash in your bank account. Using Plastiq, you can ensure your employees get paid on time. At the same time, you get an extra billing cycle (usually 30 days) to stabilize your cash flow and pay back your credit card bill. One more reason to use Plastiq is to simplify your credit card bill. It can be difficult to manage business payments when one client prefers wire transfer, another wants a check, and another prefers credit card payment. Plastiq lets you consolidate all your payments onto your credit cards. If you have a high-limit credit card, you can even consolidate all payments onto a single credit card. The biggest downside to using Plastiq is that you increase your credit card debt. If you tend to carry a balance on your credit card or are having a tough time paying back your credit card bills, then using a tool like Plastiq could worsen your situation. Credit card interest rates, which average around 14%, will wipe out the benefit of any rewards or cash back earned from Plastiq. In some cases, the cost-benefit analysis of using Plastiq might not work in your favor. The average cash back credit card offers 1.25% cash back, and the percentage is slightly higher for business credit cards. That’s well below the 2.5% Plastiq fee. Plus, most credit cards have spending limits on cash back and rewards. Once you hit those limits, you either stop earning cash back for the year or earn lower rewards. Taking all of this into account, that 2.5% fee might actually hit you harder than you think. This last point isn’t so much a disadvantage as a word of caution. Since June 2018, some Visa issuers haven’t worked with Plastiq for consumer cards. Some Visa issuers will treat the Plastiq charge as a cash advance, subjecting you to cash advance fees. You won’t earn any rewards on that charge. 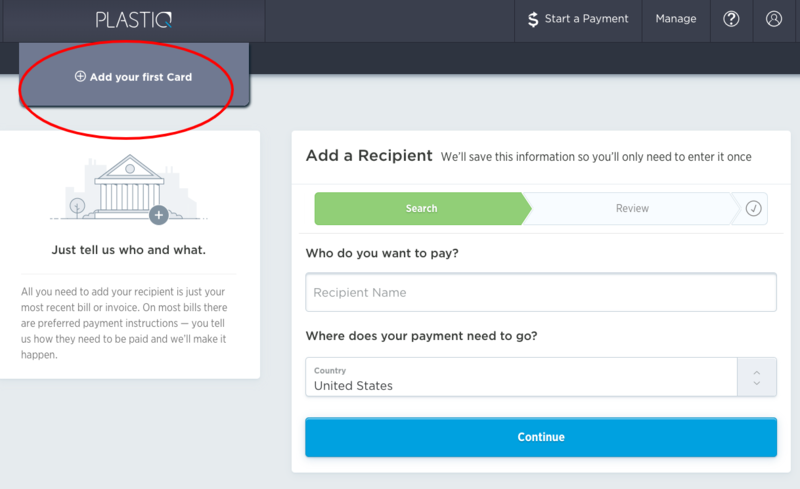 Plastiq will notify you and block a payment on affected cards. Visa business credit cardsare not affected. For more information, you can reference Plastiq’s Frequently Asked Questions (FAQ) page. The main benefit of using Plastiq is maximizing your credit card rewards and cash back. Plastiq works with all of the major credit card companies, including Visa (on business credit cards only), Mastercard, American Express, and Discover. But to earn the biggest benefit, you should use credit cards that are tailored to your business’s spending patterns. The American Express Blue Business Plus credit card offers the longest 0% interest rate introductory period on purchases and balance transfers on the market—a full 15 months. By using Plastiq in conjunction with this card, you can maximize interest-free borrowing. After the 15 interest-free months, the interest rate resets to a rate that will vary with the market Prime Rate, so be sure to see Amex’s terms and conditions for the latest rate information. This card has no annual fee and offers 2x rewards points on the first $50,000 of yearly purchases (1x rewards after that). The Capital One Spark Cash for Business credit card is one of Fundera’s top picks for cash back credit cards. This card offers 2% unlimited cash back on every purchase with no cap, making it ideal for big spenders who want to maximize rewards by using Plastiq. Capital One offers a $500 welcome bonus on this card if you spend $4,500 in the first three months. There’s no annual fee for the first year, after which the fee is $95. The Chase Ink Business Preferred credit card is a good option for business owners who want to use Plastiq to streamline their finances. This card offers a high credit limit for card holders, so you can potentially use Plastiq to put allyour business purchases on this one card. Chase offers a huge points bonus here—80,000 points if you spend $5,000 in the first three months after account opening. You also get 3x points for the first $150,000 spent each year on travel and select business categories (1x points after that). This card has an annual fee of $95. Want to use Plastiq but don’t have the credit score to qualify for a top-tier credit card? Capital One Spark Classic for Business is accessible to business owners with lower credit scores. The card offers 1% unlimited cash back on all purchases with no cap. There’s no annual fee on this card, making it a great choice for those building credit. Plastiq makes it possible to pay for almost anything with a credit card. You can pay your suppliers, your employees, and even your taxes with a credit card when you use Plastiq as the middleman between your credit card and the recipient. Plastiq can simplify your bills, and even better, help you even out your cash flow and earn more credit card rewards. However, you always want to be cautious when increasing your debt level. Plus, make sure you do the math. The benefits you earn from using Plastiq—whether those benefits are credit cards rewards, supplier discounts, or tax deductions—should offset the fees charged by the payment app. Senior Staff Writer at FunderaPriyanka is a senior staff writer at Fundera, reporting on all things small business. She also collects, analyzes, and reports on data to help business owners make better decisions. Previously managing editor at Fit Small Business, she’s also a licensed attorney who served as general counsel at a Y Combinator startup. Priyanka’s writing has been featured in Inc., CNBC, and other top tier publications. When she isn’t writing, Priyanka loves to explore NYC with her husband and daughter.